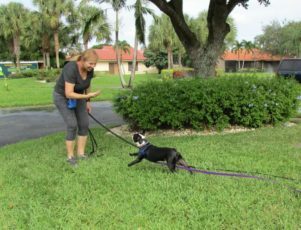 Training Success Story – Taz | PlayTrain Positive Dog Training - You Name it! We Tame it! 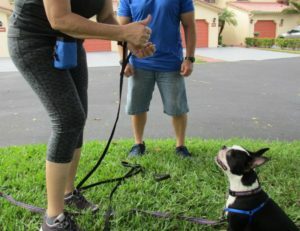 “Actions Speak Louder Than Words:” true when training a dog, imperative when the trainee is deaf. 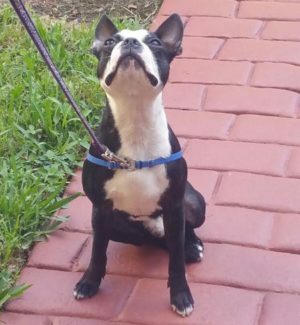 Randi & Walt called me after becoming alarmed when Taz, their 10-month-old Boston Terrier, snapped at two people who tried to pet him. “We didn’t want this behavior to progress into a real bite,” Randi told me. Very wise indeed. Taz, born deaf, was lucky to wind up in a loving home with owners willing to do what it takes to communicate with him. Randi relayed that Taz was skittish, and I explained that deaf dogs are easily startled when something they can’t hear suddenly appears, such as someone’s hand reaching over their head. Our dogs, deaf or hearing, count on us to protect them from situations they might perceive as threatening. To make Taz more comfortable with being handled, I showed Randi how to counter- condition him to having his collar, back end and head gently touched while getting a tasty treat. As with any dog, teaching attention was task #1, especially since we’d be using hand signals. 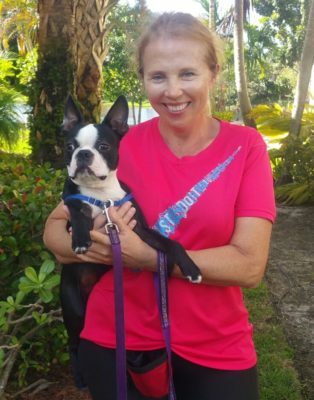 I knew the mainstays of training- verbal cues, praise, clicking, and squeaky toys, would be useless. But the basic tenets of operant and classical conditioning still hold true, as they are based in science. Instead of using a clicker, or verbal praise, we used a visual “clicker” to mark the behavior and let Taz know he earned a treat. That visual cue was a thumbs up wiggle. To teach Taz to “Watch Me,” we used a treat lure, to get him to make eye contact. Once he did, we gave a thumbs up wiggle to mark the behavior, and followed with a treat. He caught on and we had some great attention going. Next, we used hand signals for Sit, Down, Wait and Come.